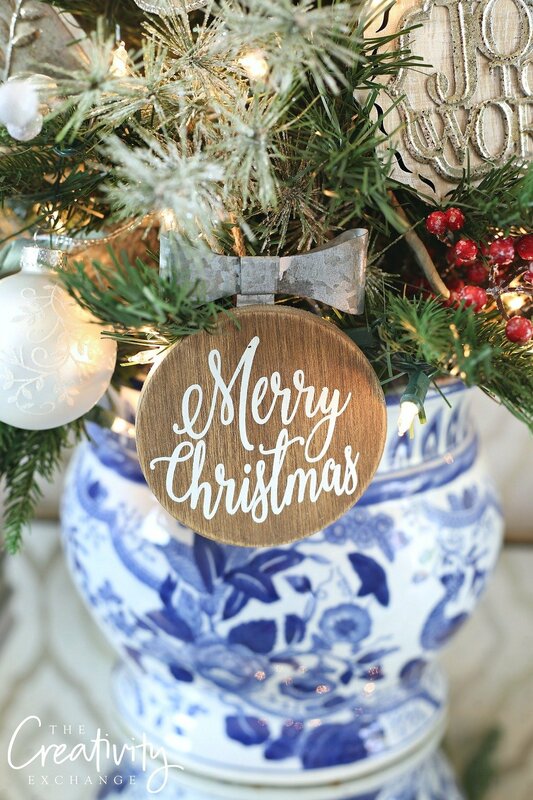 I’m getting a jump on our Christmas decorating early this year and I’m so excited to team up today with 14 amazing home bloggers and Kirkland’s to share our Christmas decor projects and tips with you. At the end of the post, Kirkland’s is giving away a $500 gift card, so be sure and sign up for the drawing! This is a collaborative post with Kirkland’s. All opinions are 100% mine. I know it’s a little early to start Christmas decorating but this year, I am helping my next door neighbor decorate her home for a charity holiday home tour that is held in our town (I’ll be sharing her home tour on the blog in December). So that means that I need to get my house decorated and ready for the holidays because things will be very busy in the next few weeks for us. I haven’t decorated my porch yet but I did something fun for our front door that I am so excited about and love! 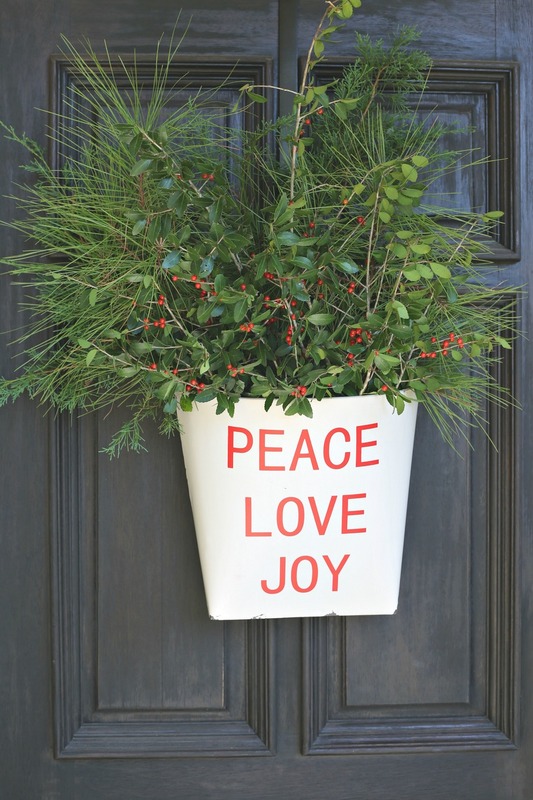 I ran across this metal wall bucket at Kirkland’s and as I looked at it, I thought it would be so fun filled with greenery from our yard on our front door instead of a wreath. I can’t tell you how much I love it and how pretty it looks from the porch! 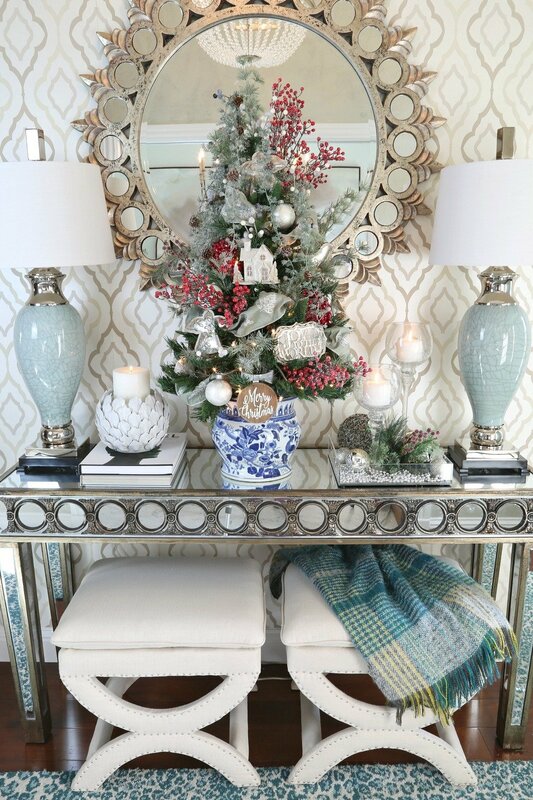 Every year in my entryway, I do a tabletop tree on my console table. I use a lighted 3′ tree and over the years I have used a champagne bucket, basket and garden urns for the base. 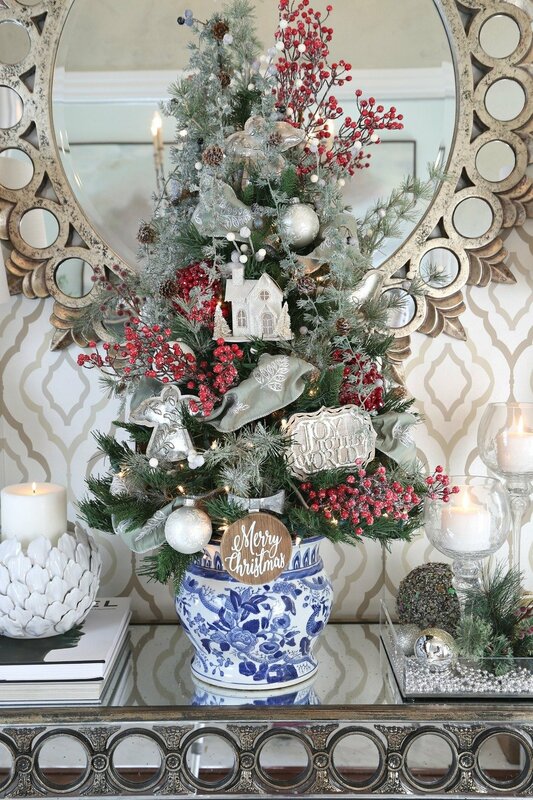 This year, I’m using a blue and white garden pot for the base and I decorated the tree with the prettiest Kirkland’s ornaments, berry balls and tree sprigs. I am so excited with how the tree turned out and I love how beautiful these Kirkland’s natural ornament collection looks on the tree. Here are close ups of some of the ornaments that I used in the tree and the link to them under the image. 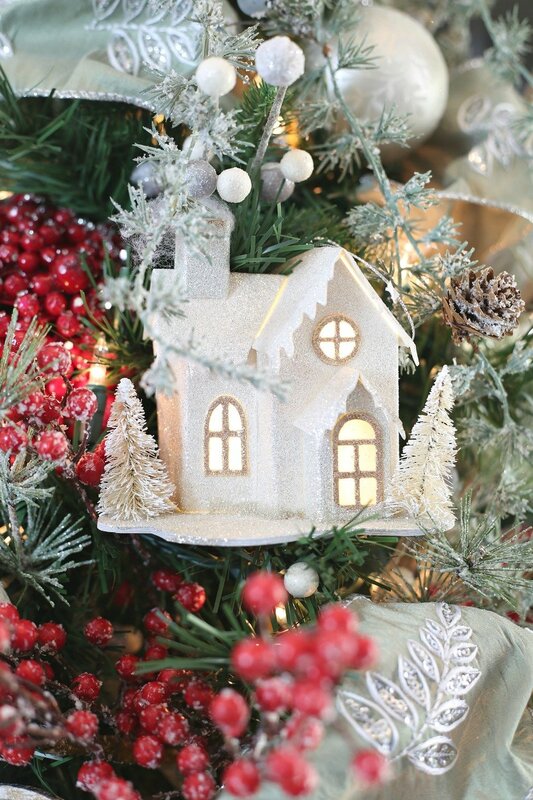 This glitter house ornament is lighted! 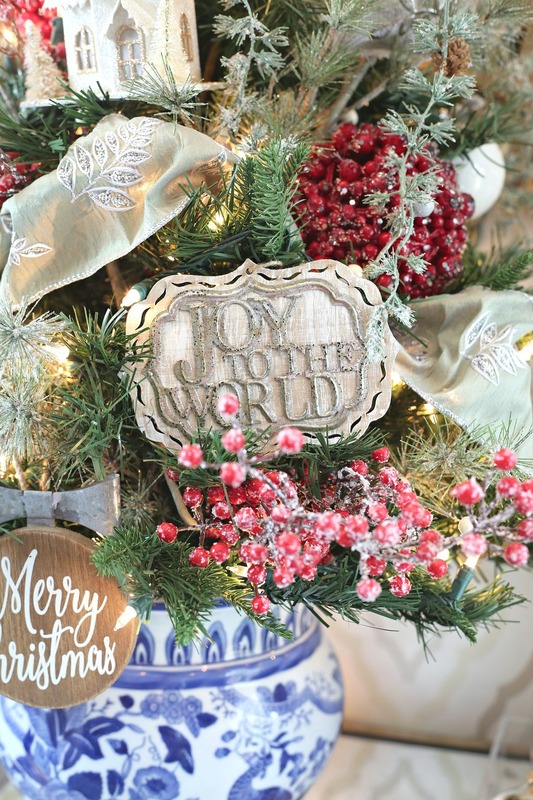 I used many of the ornaments from the Kirkland’s natural collection here. 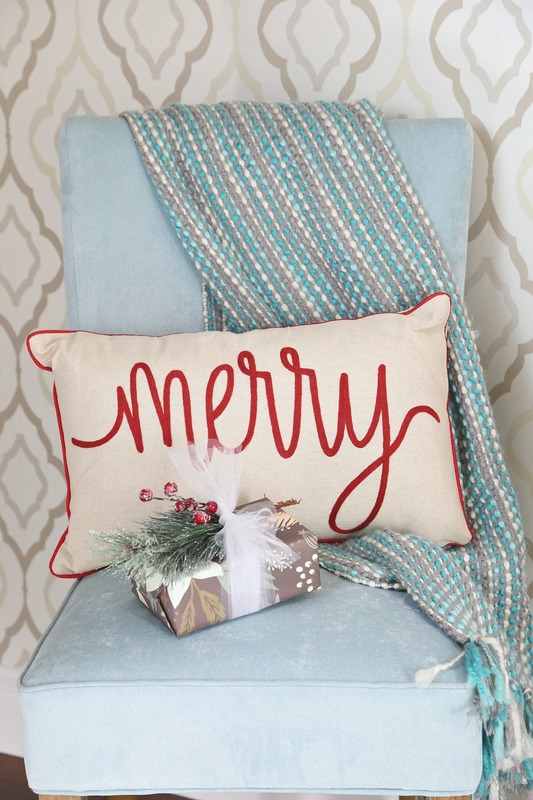 I also picked up this pretty “Merry” pillow that’s perfect for my entryway chair to give me that little pop of red that I needed. 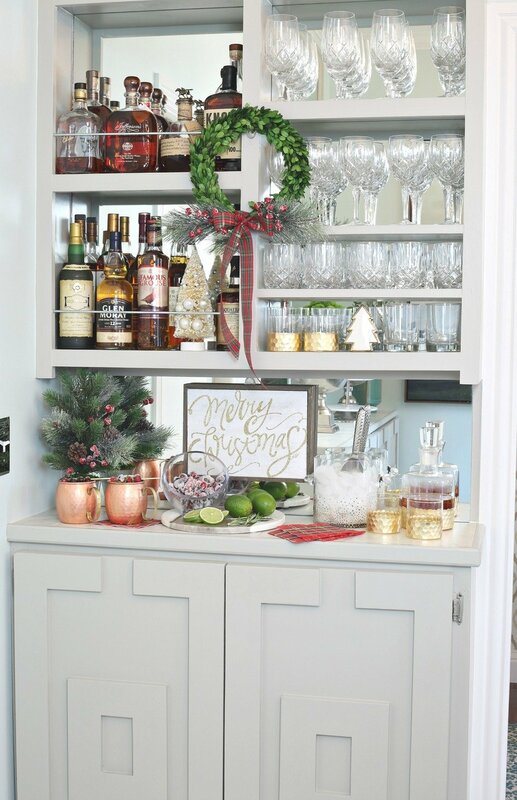 In my dining room, I haven’t finished decorating yet but I can tell you that the first thing I did this year was to decorate and ready our bar for the holidays! Priorities, right?! 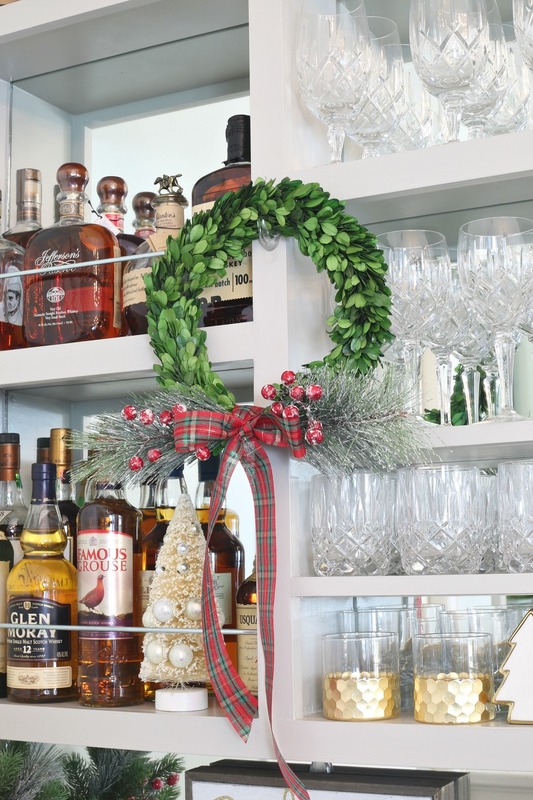 This year, I hung this beautiful preserved boxwood wreath over my bar using a temporary hook. 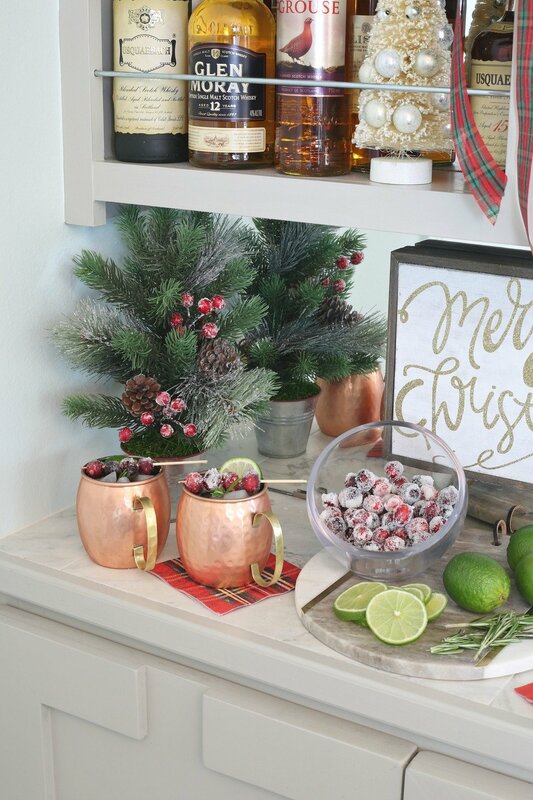 I added ribbon and pine/berry sprigs to make it festive. 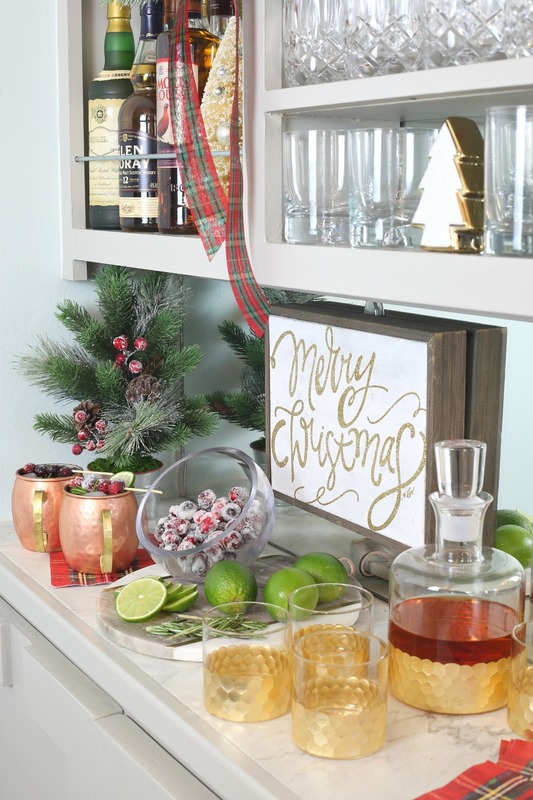 Kirkland’s has some beautiful Christmas signs, canvases and plaques and I always love to slip them in bookshelves and spots like the back of my bar for fun. 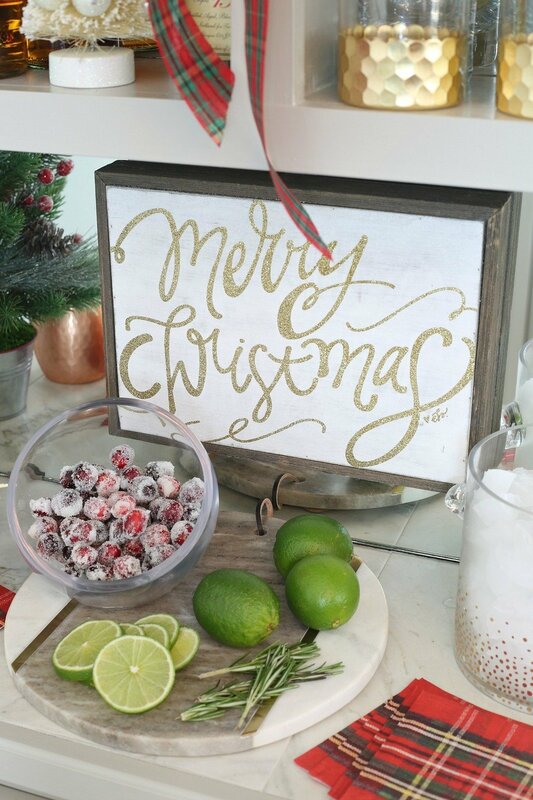 I love this barn wood framed “Merry Christmas” sign . 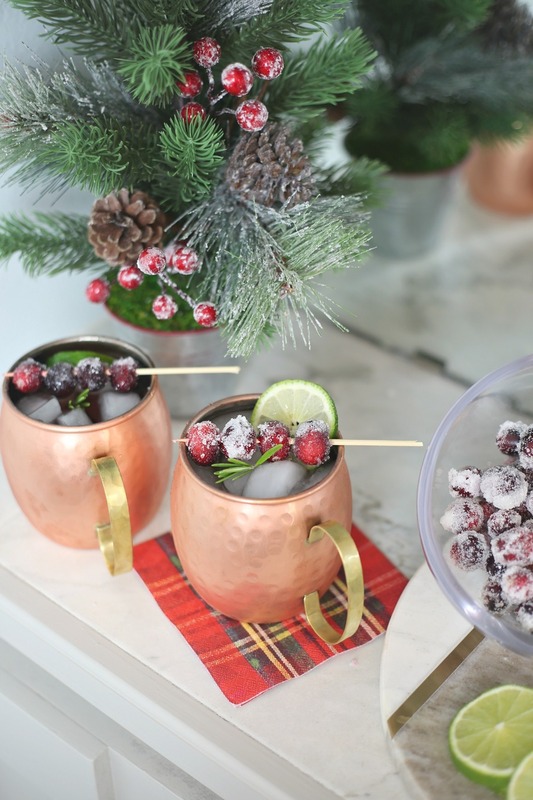 I love Moscow Mules and this year, we have already made our first Christmas Moscow Mule cocktail using these beautiful hammered copper Moscow Mule cups. If you noticed looking at my bar, my husband is a collector of vintage scotch/whisky, so I picked him up this gold whiskey decanter/glassware set, which will get lots of use through the holidays. It’s a great start for what is going to be a busy and fun holiday season and I can’t wait to share our projects with you guys that my neighbor and I are working on. Stay tuned! 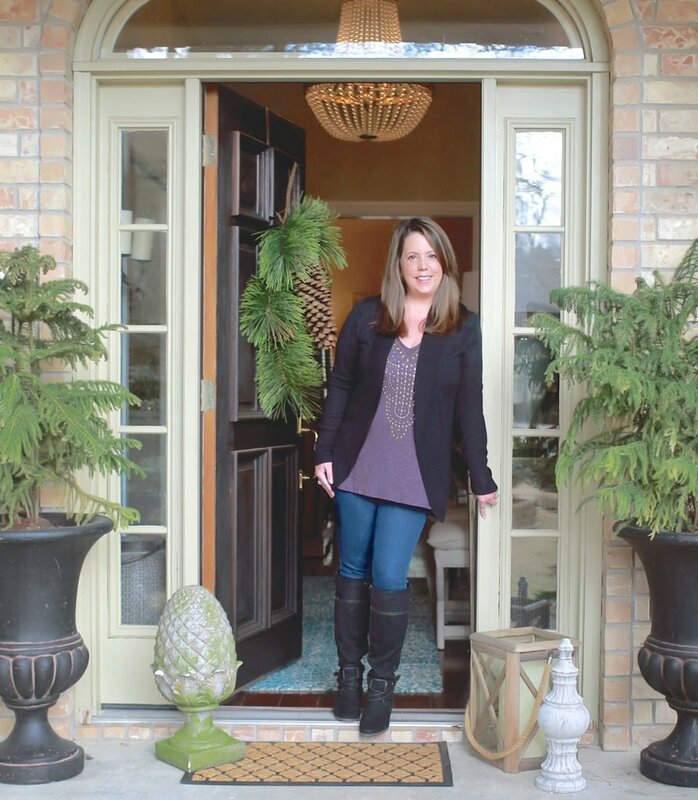 Kirkland’s is giving away a $500 gift card to one lucky winner! Here’s how you enter! It is just all so gorgeous my friend! I am in love with your front door decoration!! Loving the black & gold metal luminaries & the pre-lit bronze trees hurricane! Live the gold deer stocking bar for hanging stockings. Such a great idea! I love so many things – the sassy dip bowls are in my cart now! Thank you for the chance. 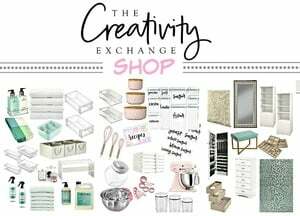 Your entry is lovely! I am drawn to the natural ornaments! I think I’m getting into the Christmas spirit! Thanks! Your holiday decorations are positively stunning! Have a good weekend. 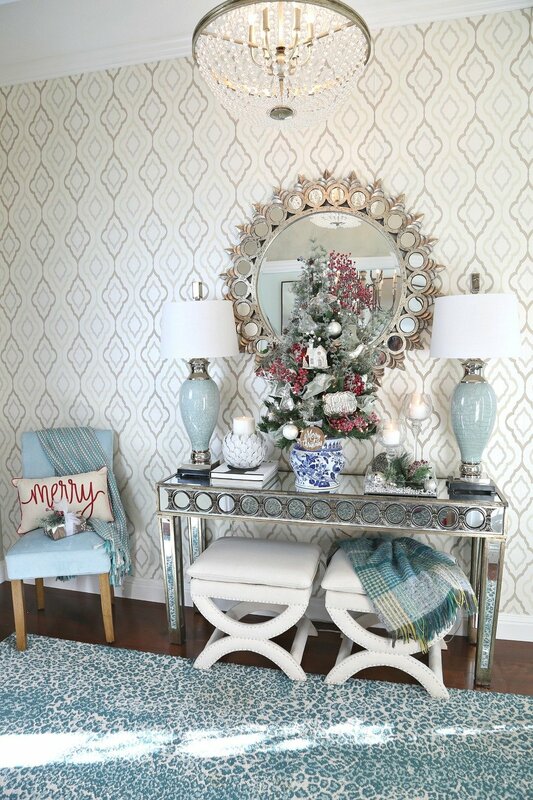 Obsessed with that vase filled with that Christmas arrangement. Heading to Kirklands to pickup everything to recreate using a similar vase of my own! I love Kirklands in general but one of my favorite year around items they have are their sachets. I love placing them in inconspicuous places around the house. I really like how they have year around scents but add seasonal scents to their collection. 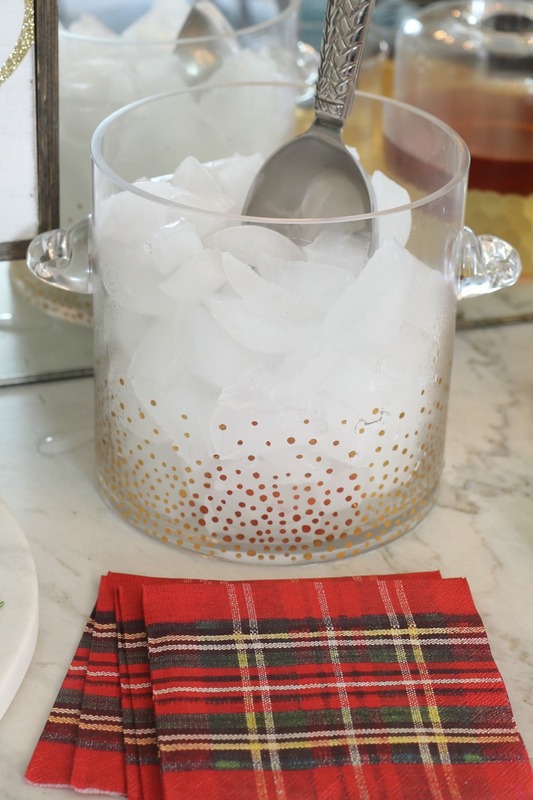 I like the idea of the metal wall bucket instead of a wreath.